We love being a Mobile Art Studio! Many of our events take place in people’s homes or businesses. We love to offer this service as many people appreciate being able to host their friends in the comfort of their own home. We travel to your home and business with all of the supplies for a fantastic painting or craft event! Set up and tear down are included with pricing! You will not have to worry about a thing when Express & Create is in the house! Our Mobile business consists of step-by-step painting classes and craft events. 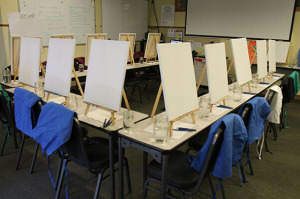 When it comes to step-by-step painting classes, we have got you covered. We offer competitive pricing, whimsical painting designs, and friendly staff. While we do have plenty of pieces for you to choose from for your event, we love to hear what our clients want! Many of our current gallery paintings are a result of a client requesting something specific for their party. We love what we do and that shows when we show up to your event. Our craft events are something we are so happy to offer, as it is something that really sets us apart. 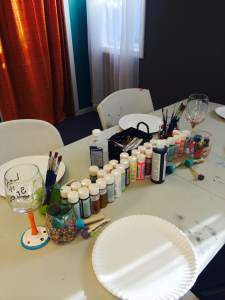 One of our favorite craft events are the Glass Painting Parties that we offer. Grab a group of friends or family and paint the type of glass of your choice! We also bring several options to choose from, and along with tons of paint colors, we bring loads of fun supplies to help customize and decorate your glass! We have celebrated birthdays, bachelorette parties, fundraisers, holiday parties, and so much more! We love to travel and are currently servicing all of New England! We definitely have plans to take a road trip – so stay tuned to see if Express & Create will be coming to a city near you!